If you have questions about Operations, Finance, Sales or Marketing you need to know you're not alone. Your past experience may include Operations gliches, Finance induced sleepless nights, failed Marketing programs, ineffective Sales programs, sales people who just don't get it and lots of frustration. Sometimes you just want to sell the company and be done with it. But what stops you is the feeling in the pit of your stomach, it's what keeps you up at night. You built this company up to the success it is and with the right help you know you can take it way further. Leave a real legacy, make sure your family is well taken care of. Then sell - don't sell it doesn't really matter. Now you're in the drivers seat. 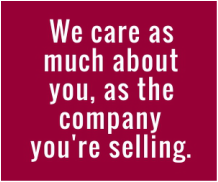 We're here to help you cut through the Sales and Marketing clutter and more easily choose what is right for you and your business. It's more than Websites, Search Engine Optimization, Emails, Blogs, Social Media, Telephone and Sales Calls, Letters and Brochures etc. All very important tools and integral to your success. It really starts with being clear on who you are, what you are offering and who you believe can benefit from your products and services. It's about increasing the value of your business and communicating that to potential acquirers. The best way to achieve success is by both thinking and doing. One of many valuable lessons we have learned from studying successful people is that no matter how famous or how rich they are, somewhere in their lives is a coach, a mentor, or an advisor. Usually more than one. The first thing a new leader does is establish their advisory group. This applies to presidents of companies or countries. You can't possibly know what to do in every circumstance, particularly if these are new to you. Smart, successful people surround themselves with even smarter associates. Getting guidance is an important element in your future success. We will be there every step of the way coaching and cheering you on. WarrenBDC will help you with the Thinking (planning) and the Doing (implementation). The only thing better than a great plan is actually executing it and enjoying the rewards of a well thought out sales and marketing program. Make every dollar, every minute and every decision count. Yes you are going to make mistakes, we all do. But if you learn something from the experience and apply the new knowledge the next time then it was a good use of your time. Don't be afraid to make mistakes, don't be afraid to try. Don't be afraid to ask for help. We hope to be helping you soon. You can do it, you are not alone. We are part of your team now.